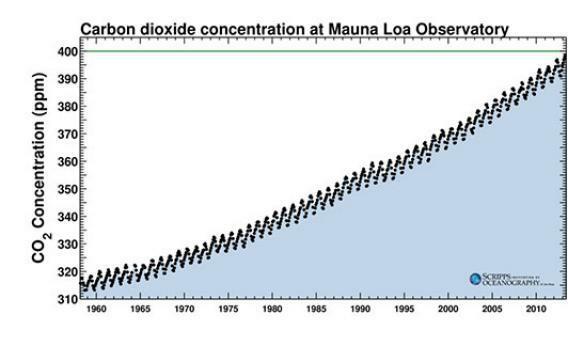 Carbon dioxide at 400 parts per million: The Keeling curve milestone measurement in Hawaii. Turning 400 is a lot worse than turning 40. The Keeling Curve as it surpasses 400 ppm. Courtesy of the Scripps Institution of Oceanagraphy at UCSD. Atmospheric scientist Ralph Keeling, director of the CO2 program at the Scripps Institute of Oceanography in La Jolla, Calif., explains the importance of measuring a CO2 concentration of 400 parts per million at the observatory that his father, Charles Keeling, set up. Catherine Brahic: The Mauna Loa Observatory in Hawaii has reportedly recorded a carbon dioxide concentration there of 400 parts per million for the first time. How significant is that? Ralph Keeling: It’s a psychological milestone. Every year in the last few decades, CO2 concentrations have been going up by about 2 ppm per year. Those changes go unnoticed, but people pay attention to round numbers. It gives you a bit of perspective on how far we’ve come—a bit like turning 40 or 50. CB: So how far have we come? RK: Before the industrial revolution, we started at about 280 ppm. One hundred years ago, levels had risen to around 300, and they crossed 350 in the late 1980s. We think the last time concentrations were as high as 400 ppm was between 3 and 5 million years ago, when the world was much warmer. CB: What did Earth look like 3 million to 5 million years ago? RK: It had much higher sea levels, forests extended all the way to the Arctic Ocean, and there was almost certainly a lot less sea ice. Today, sea ice is melting rapidly, and in the last decades we have seen the tree line moving north into the Arctic tundra. CB: Are we in a climate danger zone? RK: In my view, yes. At 400 ppm, we’ve perturbed Earth enough already that things could unfold that will be catastrophic. CB: We passed 400 ppm for the first time last year, above the Arctic. What is special about the Mauna Loa record? RK: It’s the one record that has high resolution going back to the late 1950s—when my father set it up. CB: Why did he start tracking CO2 at Mauna Loa? RK: In the early 1950s, he was at the California Institute of Technology studying carbon in rivers. As part of that, he developed a way to measure CO2 in the air. He discovered that if you measured concentrations in a sufficiently remote place, you almost always got the same number. That was unexpected. Previous work suggested CO2 levels were more variable, making measurement very difficult. The realization that there was a stable background level meant the challenge of measuring the increase might not be so great. You simply had to go to a place far enough from contamination and track it over time. The Mauna Loa measurements came later, beginning in 1958. CB: When did he first see a steady rise in CO2—what is now known as the Keeling curve? RK: The early days at Mauna Loa were fraught. Power outages meant the measuring instrument had to be shut down for weeks. It would come back on reading a different level. He thought there should be a stable background, but concentrations were fluctuating. It was only when he’d gathered a year of data that he realized there was a seasonal cycle. CB: So levels may drop below 400 ppm again? RK: Crossing from below to above 400 will play out over years, partly because there is a natural up and down with the seasons. But this time next year it will be higher still. In a couple of years we’ll never get below 400 again.